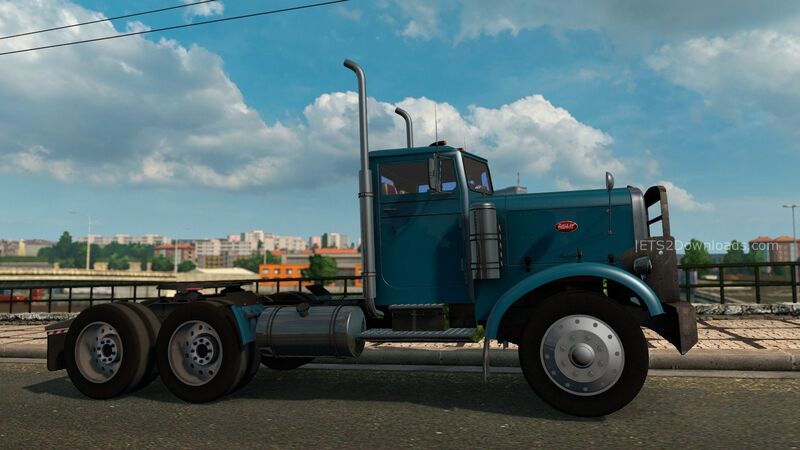 This is an updated review on the Peterbilt 351. Basically this truck is still the same, there is still one cab, several engines, 4 transmissions and 2 chassis. You still only get the standard and metallic paint. There is still very few external option’s for this truck. you can put beacons or horn’s on the roof. I choose horns and they do not work. You will find several interior styles, one will even put the steeper on the back of the cab. You will get the wheel and tire style for the time the truck was on the road, plus you can use the extra wheel options that are in the game. I did notice that the engine sound was changed. There is now a whistle in between shifting, this was not there when I first tested this truck. Why this whistle was put in, is beyond me. You will not hear this sound in North American trucks. There really is not a lot of lighting options for this truck, so if you like a lot of lights? you are out of luck. Tried this mod this morning. I had to remove it as once installed it removed all Jobs from Job Marketplace. Someone said on another download site it might be the trailer part of this mod that caused that. As of this post I can not confirm but may try this mod again later tonight. It is okay mod, other than it messing up all jobs in the game, but the sound is rather disappointing, engine sounds that is. If I was to use this for much I’d have to try and fix for my use but it seems the mod is locked. I don’t know why but I have found no problems with this mod. Have you tried to disable all other mods? Have the same problems too. Need disable all other mods first. It runs fine for me. I cannot test it with all other mods. Sorry guys :D.
I finally got around to re-trying this mod. I found that as long as I did not enable the trailer part of the mod the Job Market was okay. Seemed to get along okay with the other truck mods I have installed. However I must say this mod while nice in many ways is a let down in the sound department (interior engine sounds). A old school truck like this needs to sound louder. I’d suggest the author listen to V8 engine sound pack for inspiration. It also has issues with impacting overall game frame rate. Looks like it imposes a solid 10FPS or so hit if not more when running. I don’t have a bad PC, I7-2600k 4.3Ghz O/c with GTX970 and use 400 scaling. I can see this mod imposes a big hit compared to default trucks or a mod like Scania T. Probably some poor optimizing and bad choices in cabin reflections of certain items. Perhaps in a few revisions which I hope the author does improve. 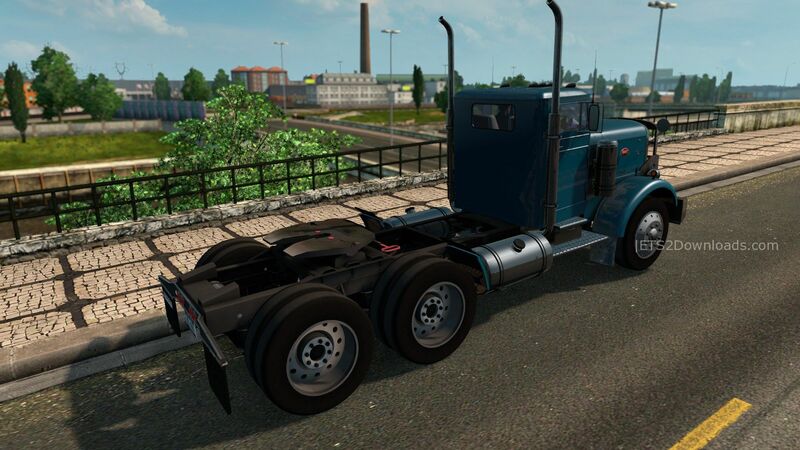 As it is , I don’t see a reason to use this over the older Peterbilt 389 which has far more accessories or the Scania T.
I just wanted to let people know if using this and Job market goes away, try without the trailer part of the mod. Oh, I did want to fix this mod myself (the sounds) but it is oddly packaged in two parts. I can’t figure out how to edit 2nd part just yet. Hello, the truck comes with three sounds, to have a nice V8 sound, just buy a Detroit Diesel. Also, i made a Cummins 275 sound mod available here too. That makes a total of 4 sounds for the truck. Thanks for testing and giving your feedback. Regards. It lags alot for me is this a common problem with it? Maybe because of the new update. I will check it again! This truck is standalone. It does not replace anything! The only thing I wish this truck had is a better engine brake sound for the detroit diesel in the Peterbilt 351. If it is any help, the engine brake on this truck is really quiet. I drove one hauling potatoes. I put this truck today on my ET2, but i cant find it!!! Where this truck is located??? As you can the in the above screenshot, you can buy it in every DAF Dealer! Thanks for this truck…its my favorite truck for now… but the 2nd scs file is locked so i cant do the modifications i like on the skin of the truck… bummer…. 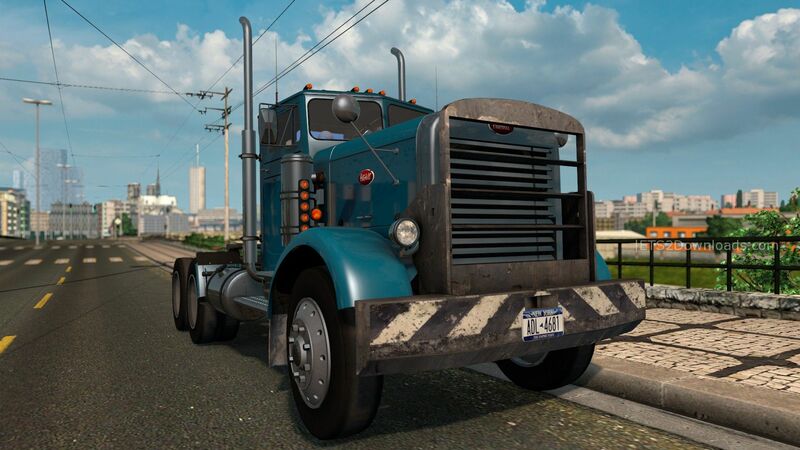 Can anyone know if it is possible that we can make skins for this Pete? I think we can, I will try to ask the template of this truck :D.
wil he also work in 1.15.1? thanx, do you also know if there is an Scania 145 mod that works on 1.15.1? what program do i need to open the mod file?? Hi Tommy, you need to use Winrar to extract the rar file! Stupid quesstion, but why cant i change the trucks colour? Thanks for the feedback dude! I hope the author can read your comment soon! I would have possibly kept it, but alarm bells started ringing when I was unable to see or accept modifications, then when I tried to leave it just kept looping. This mod by the way was in Volvo Trucks and not DAF as everyone has suggested perhaps if you have time you might like to check it out. Seems like the author has moved it to the Volvo Dealer in this new update. Thank you very much mate! Update on Peterbilt 351 version 3.0, I don’t know if the Author fixed it, however I reloaded it and moved it further down my mods, I am happy to report that it is now working OK.
I’ve got version 1.21 but it keeps crashing every time I try to add an accesory or change something. Why is the front wheels so much bigger than the rear? It looks so stupid I can’t use it! Truck does not even show up in a dealership!